I’m still enjoying The Adventures of Huckleberry Finn, and I’m flirting with The Secret Keeper by Kate Morton (i.e. I read a page or two between reading Huck Finn because I am so eager to really sit down to read it and find it if it’s good like The Forgotten Garden or not so good like The House at Riverton–I’ll let you know soon!). Yes, this is really my kitchen. Dark chocolate, fruit, almonds, granola, and coffee would keep me happy for weeks. When I hit on a good and easy recipe, I serve it into the ground. Or so it feels to me. So today I spent the morning developing a monthly meal plan with a daily theme, such as Mondays are Asian food, Tuesdays are Mexican, etc. I’ve tried monthly meal plans before, but I generally pick 30 meals and have a hard time sticking to it. So this time I have more like 12 meals that I’m repeating 2-3 times in the month. I’ll let you know how it goes. Since I have cooking on the brain, today I’m sharing my favorite cookbooks of all time. I know, who uses cookbooks when you could just search the internet? Well, I don’t have many cookbooks, but I feel I need them when I’m trying to find dinner ideas–allrecipes.com is great but it overwhelms me. 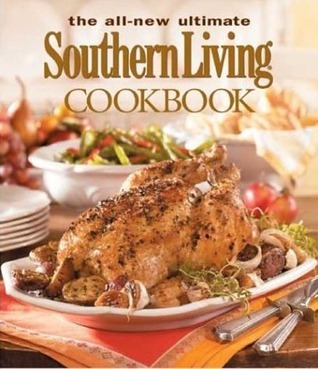 I’ll start with the best cookbook in the world: The All New Ultimate Southern Living Cookbook. My grandmother gave this book to me for Christmas a year after I got married (thanks, Gammy! ), and since then I have tried at least forty recipes. They are always perfect or nearly perfect. It’s my go-to idea book when it comes to meal planning. The recipes vary from ridiculously easy to more advanced, but you can generally tell in a glance how hard the recipe will be. If you look into it, definitely try the recipes in the Healthy Eating section. The cake section and the breakfast section are also especially good. One of our favorites is the chicken and bowtie pasta recipe. And when I feel like cooking some Italian food, I always look first in Everyday Italian by Giada de Laurentiis. I don’t actually watch any cooking shows, mostly because we choose not to have cable or satellite television (it’s becoming clear how I have time to read, now, isn’t it? ), but I think Giada de Laurentiis’s books are awesome. I’ve had this one since it first came out and it’s literally falling apart. The “Everyday Sauces” section has changed my cooking life. And if you’re a visual cookbook viewer, there’s a photo for almost every recipe. A photo that will make your mouth start watering before you even read the name of the food. This is the recipe notebook a couple of my bridesmaids gave me and the recipes they had everyone at my wedding shower give me for my book. I’ve added so many more shared recipes since then and it is a treasure in my house. It’s also falling apart and rather covered in muffin batter in places, but it will never be retired. Interesting blog! You are doing a great job here! I like what you have written and will look forward to reading more if your insights! I always worked better with a plan in mind, too, but didn’t always stick to it. Life was easier when I did. Saturdays were usually homemade pizza nights. Previous post Bookish or Nookish?